(1964) "The Game of Love"
(1965) "Just a Little Bit Too Late"
"The Game of Love" is a 1965 song by Wayne Fontana and the Mindbenders, released in the US as "Game of Love". It was covered by New Zealand musician Tex Pistol and released in 1987. The song reached #1 on the U.S. Billboard Hot 100 week of April 24, 1965 and #2 on the UK Singles Chart in February 1965. 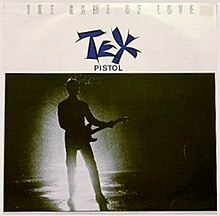 The song was covered in 1987 by New Zealand musician Ian Morris, under the stage name Tex Pistol and released as "The Game of Love". Morris was looking for a "more commercial" follow up to his Tex Pistol debut single "The Ballad of Buckskin Bob". He had begun work on a cover of The Underdog's "Sitting In The Rain" when advertising music collaborator Jim Hall suggested "The Game of Love" as a good song to cover. Morris "immediately knew how it would sound". He credits its success to "a combination of technology of the time and a good simple song". The song is notable for its unusual drum sound. Morris had been working on the audio for a card ad at the time. His curiosity piqued by a supplied video clip of a racecar going over a hill, Morris recorded the sound, sped it up, and mixed it with a clip of a snare drum. The song also features Callie Blood, Morris's later collaborator on advertising jingles, on backing vocals. The song went to number 1 on the New Zealand music charts. According to Morris's brother Rikki Morris, the song was a surprise hit and so the 500 pressed copies sold out, meaning that the single hit number one but could not remain there. The reworking of the song gave Morris a 1987 RIANZ award for best engineer and a nomination for best producer. The song was accompanied by a video by then-teenager Paul Middleditch that was also nominated for best video and is now considered one of the highlights of New Zealand 80s music-video making. A 1965 cover version by French singer Sylvie Vartan entitled Quand tu es là was featured in the 2012 American film Ruby Sparks. A cover version by The Beach Boys featuring a duet lead between Brian Wilson and Mike Love was recorded during a rehearsal session for the Lei'd in Hawaii live album and remained unreleased until included on the 2017 compilation 1967 - Sunshine Tomorrow. The song is also sampled in American rapper Eminem's song "Love Game", from his 2013 album The Marshall Mathers LP 2 and hip hop group De La Soul's song "My Brother's a Basehead" from the 1991 album De La Soul Is Dead. In the '80s a French cover was used for the main theme of the radio Morning Zoo in Quebec City: "J'écoute le Zoo". Montrose did the song on their 1987 album Mean. ^ "Ian Morris on Musical Chairs: Part 2". Radio New Zealand. Retrieved 11 November 2012. ^ Morris, Ian. "A Tale of Two Snare Drums". IG Music. Retrieved 14 November 2012. ^ a b "Rikki Morris on Musical Chairs". Radio New Zealand. Retrieved 11 November 2012. ^ "Game of Love: Charting". Charts.org.nz. Retrieved 24 October 2012. ^ "The Game of Love". NZ On Screen. Retrieved 24 October 2012. This page was last edited on 3 December 2018, at 22:12 (UTC).